Google finally officially posted on Google+ about a feature we spotted two weeks ago where Google began using the reviews from your Google My Business listings as part of your Google AdWords location extension reviews snippets. 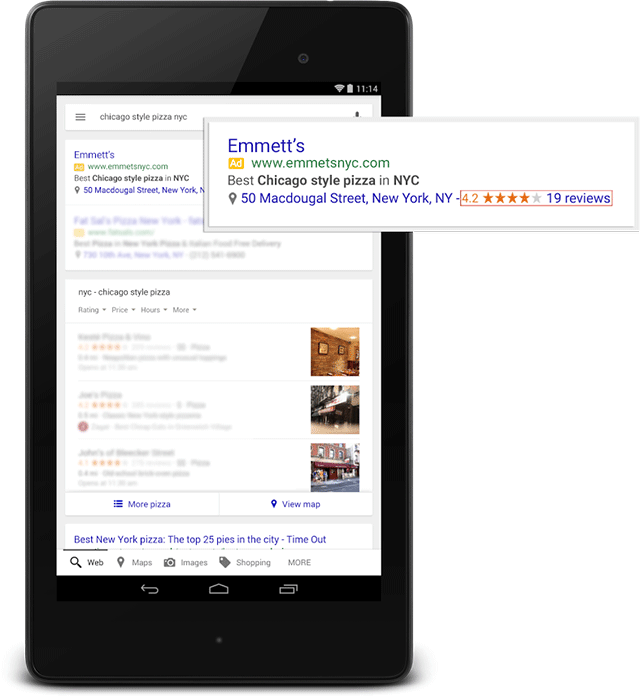 Google said that starting this week, location extensions can now show ratings from local Google My Business listings. Starting today, ratings from your Google My Business listings are eligible to appear in ads with location extensions enabled on desktop and tablet. People increasingly rely on the opinions and experiences of others to help make decisions like which pizza parlor to visit, where to get your tires rotated or which dentist to make an appointment with. Local ratings make your ads more useful to consumers searching for local information, and can improve your ad performance. To showcase your Google My Business reviews in your ads, make sure to have location extensions enabled in your account. Well, it started a couple weeks ago, but Google is ready to announce it yesterday.